ART OF TRANSIT: We haven’t had a boat pic in a while. 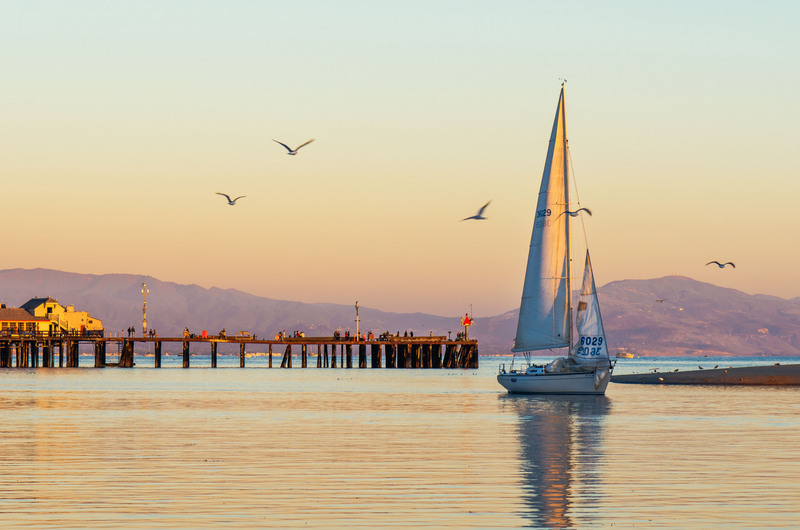 So here’s a boat pic taken from the beach in downtown Santa Barbara, easily accessible by Amtrak from Union Station, Glendale, Van Nuys and other area stops. Photo by Steve Hymon. The city’s rhythms are different by bus. You move slower, but you take in more. There’s time to think, to read. You step off a bus and breathe the scent of flowers or sizzling food on a grill. You see people whose country of origin is hard to guess and hear languages you can’t identify. Mendoza reaches for the straps of her children’s backpacks, for safety, as they cross a street. They see people they know at stops and on buses, members of their rolling community. Mendoza had a car until 18 months ago, when she got into an accident. She decided to get rid of her wheels altogether rather than pay for repairs, gas and maintenance. She also got hit by a cyclist while walking and needed surgery on her arm. The lingering stiffness makes driving difficult. Traveling by bus has all the obvious challenges, she says, but there are advantages, too. On the bus, she can look her children in the eye, talk about their days, help them with their homework. If she went off to work each day while they attended neighborhood schools, they’d have too much idle time, she says. Very thoughtful piece. Give it a read. One topic not directly broached is that many people need to take the Metro system multiple places and that often means multiple transfers in the course of a day. But the system doesn’t allow transfers except to those who have passes. That’s going to be something tackled in the fare restructuring next year. The editorial makes a reasonable argument: most people don’t know that it’s illegal to step off the curb into a crosswalk after the countdown begins on the pedestrian traffic signals. And, therefore, the LAPD shouldn’t be handing them $190 or $250 tickets during their current crackdown in DTLA. Sure would be nice to see that kind of enforcement on motorists who show little or no respect for crosswalks. On a related note, I love how the LAT editorial mentions they learned of the crackdown in the Downtown News but doesn’t provide a link to the original Downtown News article. That’s just rude — but something the LAT does to try to keep readers on its site. Cincinnati’s new mayor helped stop construction of a downtown streetcar earlier this month. And now he has rejected a plan that would involve having a regional transit agency and private partners pay for operating expenses — his big concern. The Federal Transit Administration says it will yank a $44.9-million federal grant if the city doesn’t decide to re-start the project by Dec. 19. About 2,000 feet of tracks are in the ground. Saudi Arabia remains the only country in the world in which women are banned from driving although, as the above video shows, some are courageously defying that ridiculous law. Semi-related: there is a terrific two-part series in the New Yorker Dec. 16 and 23rd editions called “The Lost World.” The story, by Elizabeth Kolbert, looks at historical waves of extinctions that have swept across our planet and uses that to put into context the current and expected future wave courtesy of climate change. The article is (appropriately) behind the New Yorker’s paywall — this kind of journalism should not be free — so either buy the digital edition for tablets or pick up the magazine at a library or newsstand. As the metro Austin area has ballooned to 1.8 million people in the past 20 years, traffic has (surprise!) grown appreciably worse. One study finds that if nothing is done, the current 45-minute, 19-mile commute from one ‘burn will take 2.5 hours in the year 2035. A toll road was built east of town but it’s so far east that no one is using it and the speed limit was jacked up to 85 mph in hopes of luring some motorists. Thus far, many in Austin seem to agree the region has a problem and big-time behavior change is the only solution — but details on how that will be done are lacking. Well, it’s Texas and if you’re going to have a problem, go big! Dallas, btw, responded to its traffic problem by building 85 miles of light rail in the past 17 years. Actually, buses, by themselves, aren’t as good a route to a brighter future as trolleys, subways, and “El”s. And not only has Dallas gone big on urban rail (including a rather nice “heritage” line, the McKinney Ave. “M-Line” trolley), but so has Houston, in the past few years, despite opposition from certain people in high places. I’ve ridden both systems, over the course of my travels. There’s a difference between enforcement of a criminal offense versus something that is so minor that it’s ridiculous to be spending tax dollars to go after. IMO, jaywalking fines is the latter. I see it as yet another dumb quota system set by the city to make up for their budget shortfalls. What next? A $200 fine for using plastic bags once the plastic bag ban comes into effect? You know it’s gonna happen. This city has this problem with megalomania that the powers that be thinks it can control everything and people’s everyday lives. You can’t do this, you can’t do that, that incurs a fee, you need a permit for that, there’s a fine for that. The rules are so dumb and so trivial that’s becoming too overwhelming for the average Jane or Joe get through their lives living in this city. This city has to learn to stop meddling in trivial matters and rather, learn to get their own act together. We need to bring back common sense. For the amount we’re spending on law enforcement to hand out fines to jay-walking and the attrition rate of return from those who actually end up paying the fines, wouldn’t it be better off to just build a pedestrian bridge instead? That’s the way of thinking that this city’s leaders should be doing. I’ve been to Austin this past summer. It’s amazing how many cities do not learn from L.A.’s mistakes. They still think that one can build more freeways instead of investing in light rail. Austin has one light rail line. They should be planning multiple extensions or suffer the same fate of L.A.; playing catch up for decades to come. Austin’s rail line is considered commuter rail, not light rail.